The Su-37 is a super maneuverable fighter jet, copied from the Su-35 prototype. 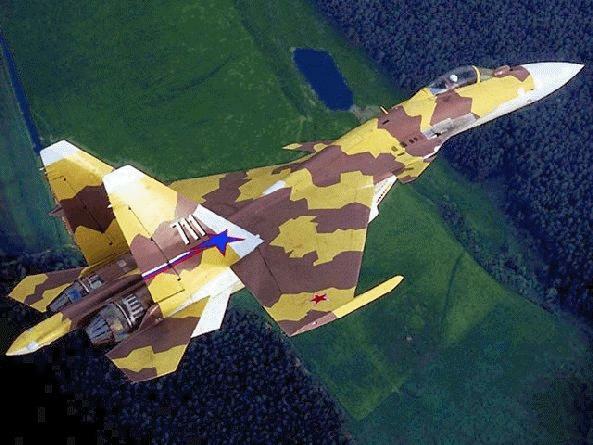 The fighter jet is similar with the Su-27. The Su-37 is still in development by the Russian company Sukhoi and is determined for the Russian Air Force. It's a air-defence jet, and a ground-attack jet, which should be operate under all weather conditions. However Russia still hasn't give a order. Sukhoi works with the money from what China has paid for the Su-37 licence. In contrast with the Su-27 the Su-37 has protect material made from carbon-fibre with a alloy of aluminum and lithium. The nozzles in the 2 engines have been replaced by titanium. Maximum speed is around 2.4 mach without bombs or missiles. The aircraft has a radar which can at the same time observate the air and the threats on the ground. This radar, a digital phased array radar can more like: do ground surveillance, searching and select enemies in the sky, and warning to avoid determined fields. The aircraft has also a satellite control navigation system. With a fly-by-wire system it has a high level of maneuverability. With ECM (Electronic Counter Measures) pods mounted on the wings the Su-37 can do electronic warfare. The Su-37 has 12 standard which can be expanded to 14 points to carry air-to-air and air-to-surface missiles.